Born in 1926 in Paris, Claude de Soria took refuge in the South of France during World War Two before departing for Tunisia in 1943, where she finished high school. Back in France she attended the drawing classes of André Lhote and Fernand Léger (1950) at the Grande Chaumière, before discovering sculpture with Ossip Zadkine (1952). During the following years de Soria spent her time reading, going to concerts and museums throughout France, and travelling for the first time to Spain and Italy. 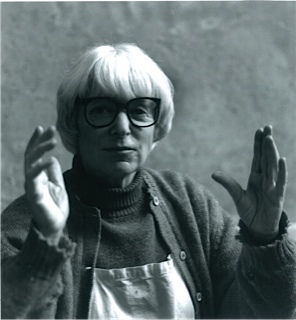 With her particularly sensitive line, she drew – as she had been doing since childhood – her impressions in sketchbooks, where “snapshots” of the Feria in Cordoba or of the Palio in Sienna can be found, as well as details from sculptures, capitals, and paintings. She also discovered the works of Pisano and Michelangelo. At that time de Soria was also working with clay. In 1972 she travelled to the Sahara desert, where the natural reliefs of the landscape triggered what seemed like an earthquake inside her. In 1973, thanks to a cement bag forgotten by workers in the courtyard of her studio, she definitively found her own voice. From that moment she understood how she could take advantage of a material at once volatile, malleable, and easy to knead and amalgamate. As time went by she multiplied experiences: she tried various dosages and qualities of cement powder, sand, fiber, water, and internal structures, as well as many molds and supports — glass, cellulose acetate, cloths, papers, etc. — which in turn led to a variety of shapes — circles, squares, rectangles, spheres, cylinders — all the while making sure to let chance play its part. She participated in numerous collective exhibitions in major institutions such as the Centre Pompidou (for the exhibition “elles@centrepompidou” in 2009/2010, among others), the Musée d’Art Moderne de la ville de Paris, the Musée des Arts Décoratifs, the Fondation Cartier, and others.